Uglyworld #984 - Freiburger Dom (Project BIG - 48-365), originally uploaded by www.bazpics.com. 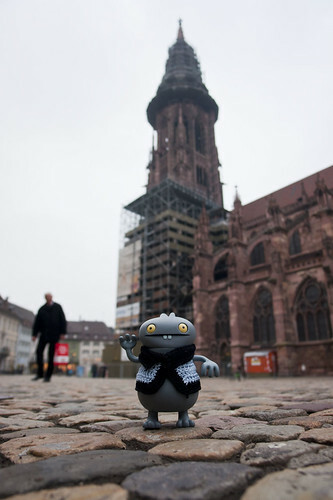 Todays I decideds to ventures a little furthers into the city of Freiburgers (I thinks this may actuallies mean that somewheres in the city you can gets free burgers, but I doesn't finds them yets!). After some walkings around I finded myself standing in fronts of the awesomes architecture of the locals Minster, or church is the easiers way to calls it. All arounds it there is gargoylers and spires stickings out heres, theres and everywheres, so much to looks at! I tooks myself on the tours of the Minster to haves a goods look around and to hopefullies learns more to explains to you alls out there in interwebs-land, but unfortunatelies they tolds me no photos was alloweds insides so I had to settles for one outsides insteads. The Minster was started to being builded backs in the years 1200, I can't even remembers what I dids this time lasts year never minds think back over eight hundreds years ago, long times I thinks you will agrees! The buildings was starteds in a "Romanesquers" style and then finisheds off in "Gothics" style some years laters, but the foundationers was actually from an even olders church which was builded back arounds 1100, supers old!!! I learns that the bigs tower had nots just one bell but sixteens of them, the biggers one weighs three thousands, two hundreders and ninetees kilogrammers, which is abouts the same as fifteen millions uglies, mentals! You can hears the biggers bell only a couple of timers a week, so you needs to plans carefullies if you wants to hears it making noises. Minster survives almosts completely as though nothings ever happeneds, amazings when alls the other buildings arounds the markets square gets damageds or evens destroyeds. A cools place to goes and visits if you finds yourselfs in the cities of free burgers, now I must goes off and tries to finds them as I is hungries now after todays adventurising.